Buying a home is a big deal. We’re here to help you navigate the process. Is homeownership a possibility for me? You may think purchasing a home of your own is out of reach. Facing significant debt after a divorce, Tamla did as well. But with a homeownership advisor on her side she learned about the process, repaired her credit and realized her dream. We can help you realize your dream as well! Our network of nonprofit Homeownership Advisors can determine your eligibility for down payment assistance, special loan programs and more, and will be by your side through the entire home buying process. Home Stretch offers in-person, classroom style workshops taught by certified home buyer education professionals. You'll hear from lenders, real estate agents, home inspectors and others. Framework was designed by experts in online learning. It's comprehensive, so you'll have all the facts you need to navigate every step of the buying process. If a Homebuyer Education course is required by your lender, you should confirm that Framework is accepted before taking the course. The Homeownership Opportunity Alliance is a coalition of engaged industry leaders who are actively dedicated to advancing homeownership equity in Minnesota The path and time it takes is different for everyone, but with patience and persistence, you can succeed in laying a foundation of building assets and success for you and your family! In today's tight housing market, rents are at an all-time high. The fact is, if you can afford your rent, you often can afford a modest mortgage payment. And owning, compared with renting, provides an opportunity to build equity and wealth. Credit scores are not fixed and can rise and fall depending on your actions. We can connect you to a trusted advisor who can help you clean up, repair or build your credit score before applying for a loan. Do I need to make a 20 percent down payment? You don't always need a big down payment to buy a home. Sometimes the down payment can be less than a rental deposit. Many lenders offer products with down payments of 3.5 percent or less. You also may be eligible for down payment or closing cost assistance. 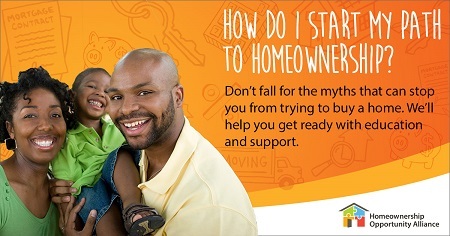 Talk with a Homeownership Advisor for free to explore your options. You don't have to do this on your own! In addition to getting support from your family and friends, we can connect you with nonprofit partners that can guide you through these and many other questions on your path to homeownership.